Sydney gallery-guides.com - Sydney, Australia art galleries guide Sydney Art Gallery of New South Wales (NSW) information, exhibits, paintings, sculptures, exhibitions, Aboriginal art, European and Asia Art, guided tours, address and location of Sydney Art Gallery of New South Wales (NSW), Art Gallery Road, The Domain, Aboriginal dance performances, tel / telephone number, open hours, admission charges, and general information about Sydney Art Gallery of New South Wales (NSW) in Sydney area, New South Wales NSW, Australia - Last updated 30/10/2012. 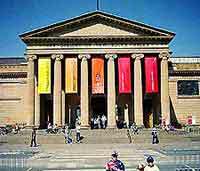 Situated near to Sydney's St. James train station, the Art Gallery of New South Wales (NSW) is home to a magnificent collection of 19th- and 20th-century Australian art, Aboriginal art, together with European and Asia Art, some of which dates back to the 15th century. Additional attractions at Sydney's Art Gallery of New South Wales (NSW) include daily free guided tours at 13:00, Aboriginal dance performances at 12:00 from Tuesday to Saturday, and many temporary exhibitions throughout the year. The Art Gallery of New South Wales (NSW) is located in the Central Business District (CBD) of Sydney.